Learning the days of week is very important in everyday conversation. Here you are going to learn how to pronounce these words and how to use them in sentences. There is an infographic to make learning easier and there are recordings to listen and learn the pronunciation. The dialect used in this post is Laventine dialect/ Shami dialect which is a dialect used in Lebanon, Syria, Palestine and Jordon. Sunday is the first day of the week. It is the first day of the work. Monday is the second day of the week. I go to the gym every Monday. Tuesday is the third day of the week. I go out with my friend every Tuesday. Wednesday is the forth day of the week. I have a meeting this Wednesday. Thursday is the fifth day of the week. I have an appointment with a doctor this Thursday. Friday is the sixth day of the week. I see my family and we have lunch together. Saturday is the seventh day od the week. Friday and Saturday are the weekend. Many people learn Arabic to improve their jobs. 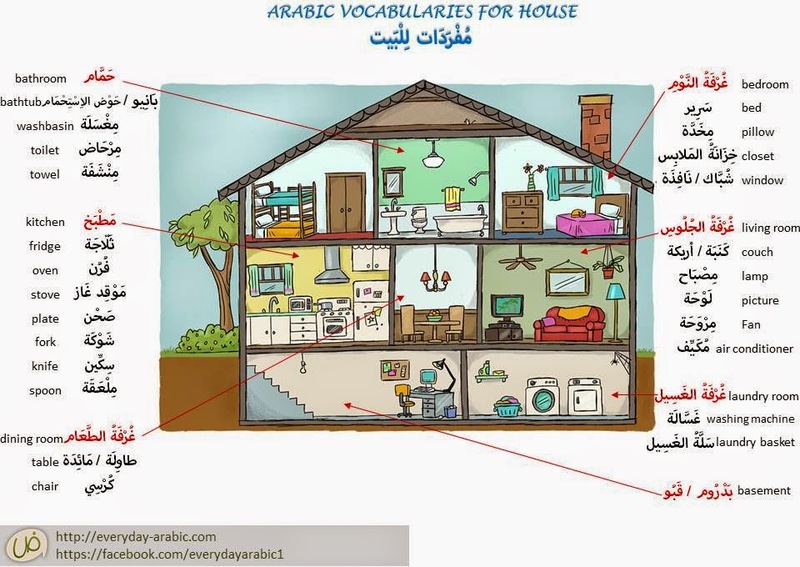 Others work in Arabic company and need the language to communicate with colleagues and clients. So let's start with the first question: What is your job? The woman: How are you? The woman: What is your name? The woman: What is your job? The woman: Where do you work? The woman: How much is your salary? الرَّجُلُ: رَاتِبِي تِسْعَةُ آلافِ دُولارٍ فِي الشَّهْر. The man: and you, what is your name? The man: What is your job? The man: Where do you work? The man: How much is your salary? Please share with us what do you think about this lesson? or any question you have. The truth is that it's absolutely impossible to live a life without falling in some kind of love in one way or another. Whatever the philosophy of love you believe in, you need to know how to say the right words to the right person. And when we talk about Arabic language, no one would argue that Arabic language has such poetic sound. So, when we mix romantic words and poetic sound, it is such a LOVELY combination. In the following infographic, you will learn eleven very common romantic expressions that are used in both standard Arabic and dialect. Of course, there are more than these 11 phrases, but I can say that these represent a good start. تِقْبِرْنِي: TU'BURNI which literally means "may you bury me" or "I love so much that I wish I die before you"
نَظَرِي: NATHARAI which means "my vision power" or something like that. يا بَعَد عُمْرِي: YA BA'AD UMRI which also literally means "I wish I die before you"
حَيَاتِي: HAYATI which means "my life"
Anything you want to add to this simple list? Did you ever hear/ or use one or more of these expressions somewhere? Please, share with us your experience. Feel Free to ask any question or add comment in the box below. Ramadan is the ninth month of the Islamic calendar and is the time when Muslims observe a fast from sunrise to sunset. Muslims believe that this time is a glorious chance given to have sins erased, and gain a higher position in the eyes of Allah (SWT). The following infographic demonstrates some common expressions that you might use or hear them during this month. Please, feel free to ask or give feedback in the common box below. A common expression to greet others when this month starts. It means “Ramadan, the Generous Month”. The generosity is by the rewards that Allah will grant who makes faithful and intense worship during Ramadan. Another common expression for greeting. It means “Ramadan, the Blessed Month”. Allah distinguished this month with special worship that is the fasting and excess of prayers and reading the Quran. Muslims are obligated to fast every day from dawn to sunset during this month. Fasting requires the abstinence from food, drink and sexual activity. Another meal traditionally eaten before dawn during Ramadan; the final meal before the day's fast begins. It refers to extra prayers performed at night in the this month. They are not compulsory. However, many Muslims pray these prayers. It means finishing reading entire Qur'an. Muslims are encouraged to do that because the Prophet Muhammad used to do that every Ramadan. 1- Print out the previous picture and hung it on a wall where you can see it a lot. 2- Use these vocabularies daily. At least, three words every day. 3- Listen to TV shows and notice how these words are used and pronounced especially if you are interested to learn a dialect. Clothing performs a range of social and cultural functions. Clothing can be used to indicate social status and convey individual, occupational, and sexual differentiation. The Arab world is full of rich and diverse communities, groups and cultures. Differences exist not only among countries, but within countries as well. Arab dress for men ranges from the traditional flowing robes to blue jeans, T-shirts and western business suits. The robes allow for maximum circulation of air around the body to help keep it cool, and the head dress provides protection from the sun. At times, Arabs mix the traditional garb with Western clothes. Headdress pattern might be an indicator of which tribe, clan, or family the wearer comes from. However this is not always the case. While in one village, a tribe or clan might have a unique headdress, in the next town over an unrelated tribe or clan might wear the same headdress. Arab dress for women also range. Adherence to traditional dress varies across societies. (More traditional—Saudi Arabia Less traditional – Egypt). Traditional Arab dress features the full length body cover (abayah, jilbob, or chador) and veil (hijab or chador). In some countries, like Lebanon, Syria and Egypt, it is no imposed upon them and women are free to choose whether to wear veils. However, in other places, all women wear veils out of modesty. Rural women, who typically work in the fields, may wear less restrictive garments lighter in color and weight. Below, most common clothes in Arabic. Time is money, or as we say it in Arabic: الوَقْتُ مِنْ ذَهَب (= al-waqt men thahab). Telling the time is always a challenge in any language because it quit between language to another. First, let's introduce to few vocabularies about this subjects. Also, take a look in this picture for different types of clocks. depending on where the big hand is pointing to. The next infographic will describe which formula you should use and when. If you have any question in this subject, you can leave it in comment box below and I'll be happy to help you. Now, if you understand how to tell the time in Arabic (or read the watch), Take this quiz of 6 different pictures for the time by choosing the correct answer. You don't need to register or any thing, just click on START and your grad will show in the end of the quiz. - Extremely popular with Arabic speakers. - It’s usually said with a lot of zest and enthusiasm and is often accompanied by a hug or a kiss on the cheek! - When you hear it, you can reply with مرحبتين (=Marhabtain) which literally means: Welcome twice. - To be polite when you ask for something. - Whatever the cases you want to thank other. - The original word is مُبَارَك (= mubarak) which also used for congrats sometimes. - Usually it’s said after someone say his/her name. - Very formal and polite expression to welcome people you meet for the first time or VIP people. - Used as apology if you do something wrong, get late on a appointment or forget to do something for someone. - It’s said in the end of the meeting or as an act of parting or leave-taking. If you have suggestions that can be added to this list, please mention that on comment below. Any question are welcomed too. I find it interesting how each country, or region, has their fruits. I live in Saudi Arabia and most of the time you can find Orange, apple and banana in all stores, and when I say 'most of the time' I mean EVERYDAY in the year. We don't have summer fruit and winter fruits! That something only taught in schools. When I visit my hometown, in Syria, the story is totally different! even the taste of same fruits are different. It is like you taste them as first time in your life, it is like HEAVEN. I used to hear about fruits like cranberry, blackberry and passion fruit but they don't grow in Arab country. I see them sometimes in stores (in Export section) but they can be very expensive and I think even the taste is not that good as in their original country. And the list going on..
As all nouns there are singular and plural. This card is part of giveme5dictionary that focus on 5 words in each card. Notice that the only different between singular and plural names is (ة) which called in Arabic التَّاء المَرْبُوطَة (= Al-ta' al-marboota : Tied Ta' ). This is one of the cases when convert from singular to plural. 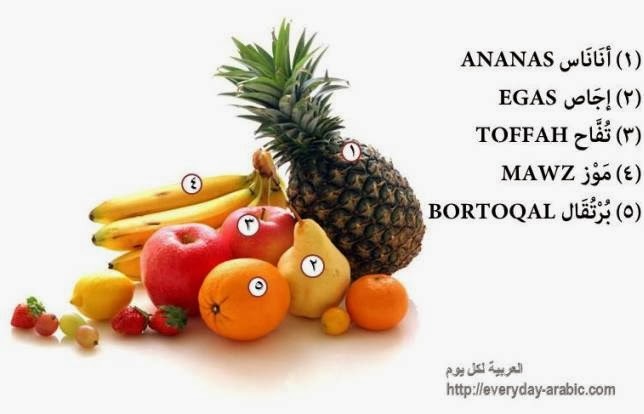 Watch the video (only 34 s) to practice on the pronunciation of these 5 fruits and other too. Your comment or question are always welcomed. 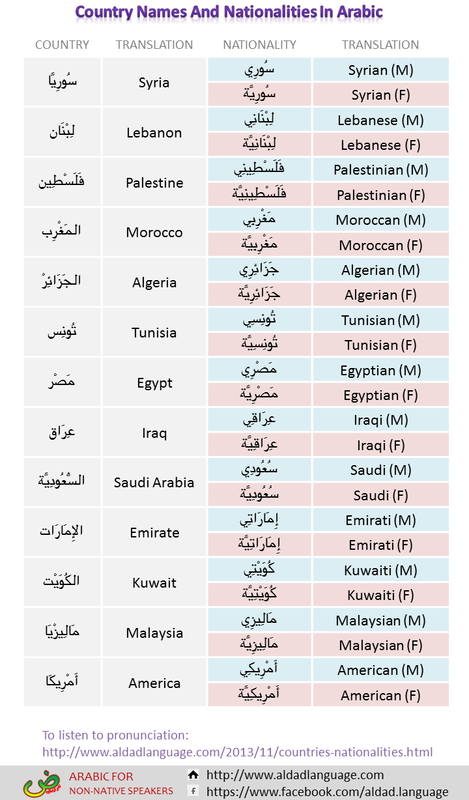 In Arabic, colors are treated differently than they are in English in two ways; the names of colors must agree with the gender of described nouns and the names of colors come after the described nouns, not before as in English. Let's discuss each point individually. In the infographic below, we identify the names for both masculine and feminin nouns. Since EVERYDAY ARABIC always commit to teach the language that is actually used in daily life, both MSA (Modern Standard Arabic: فُصْحَى = Fusha) and slang are used in this infographic. 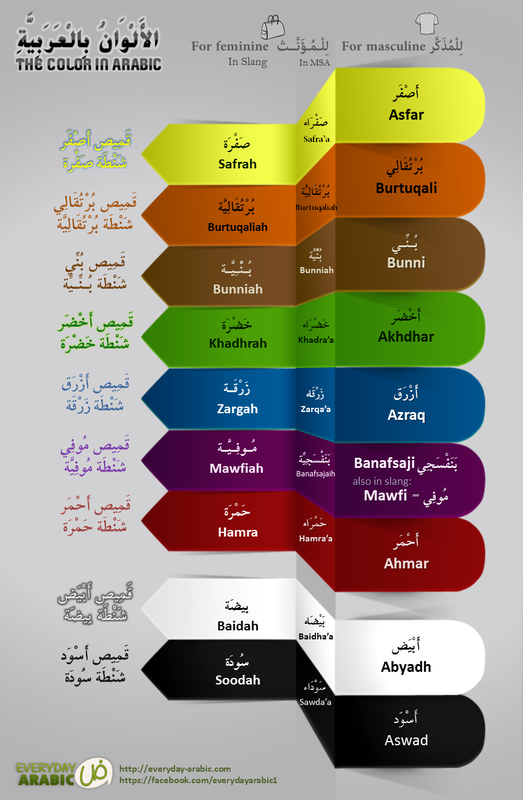 As you can see, masculine names of colors are same for both MSA and slang (except purple: بَنَفْسَجِي = Banafsaji which is sometimes replaced by the word مُوفِي = Mawfi) while feminin names are not. * MSA is Modern Standard Arabic (فُصْحَى = Fusha) which is only used in writing and reading. UPDATE: Many followers have been asking me about the color purple in Arabic. To make things clear, there are four common names for this color and each color refers to a different plant's name. The following picture demonstrates the plant's name and the color's name. In this example, the noun that needs to be described is قَمِيص (= Qamees : T-shirt). In Arabic, the noun comes before the color (yellow) --> قَميص أَصْفَر while in English, the color comes before the noun --> Yellow T-shirt. Same thing goes son all other colors. Also, see this small book (أنا أحب الملابس I like clothes) to teach children different adjective the clothes name in Arabic. Don't forget to listen to the audio to get used to the pronunciation. Describe emotions is very important when you learn any language. This post will show you how to describe 6 kinds of emotions in both feminine and masculine phrases, where the only different is Ta'a MARBUTAH ـة in the end of feminine phrases, ex. 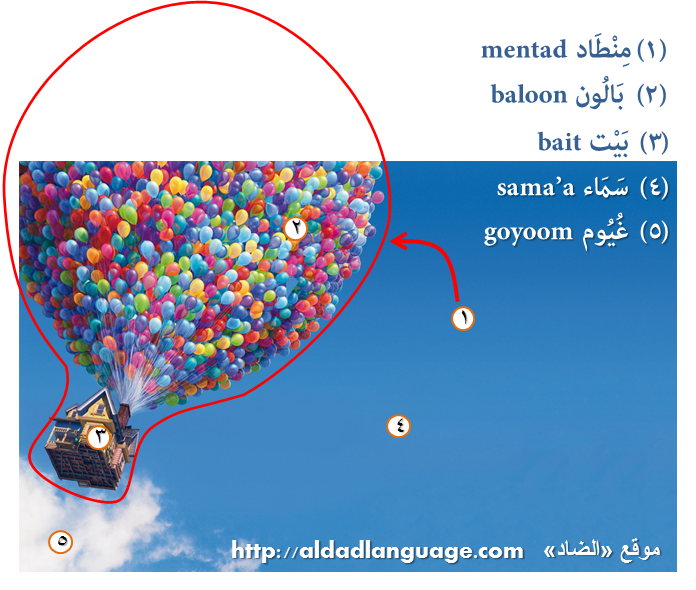 a female may say: أنا فَرْحَانَة but the male would say: أنا فَرْحَان. 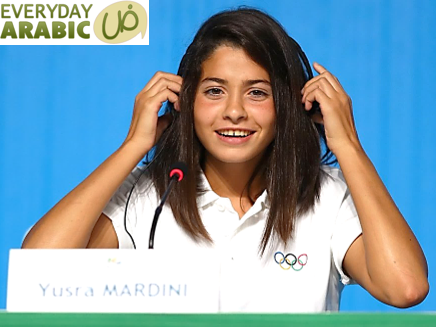 Be sure to listen carefully to pronunciation of all words using the embedded audio, replay it if you need and practice on using it while your speaking with Arabs people. If you have any question or suggestion, please use the comment and we'll be glad to reply as soon as possible. 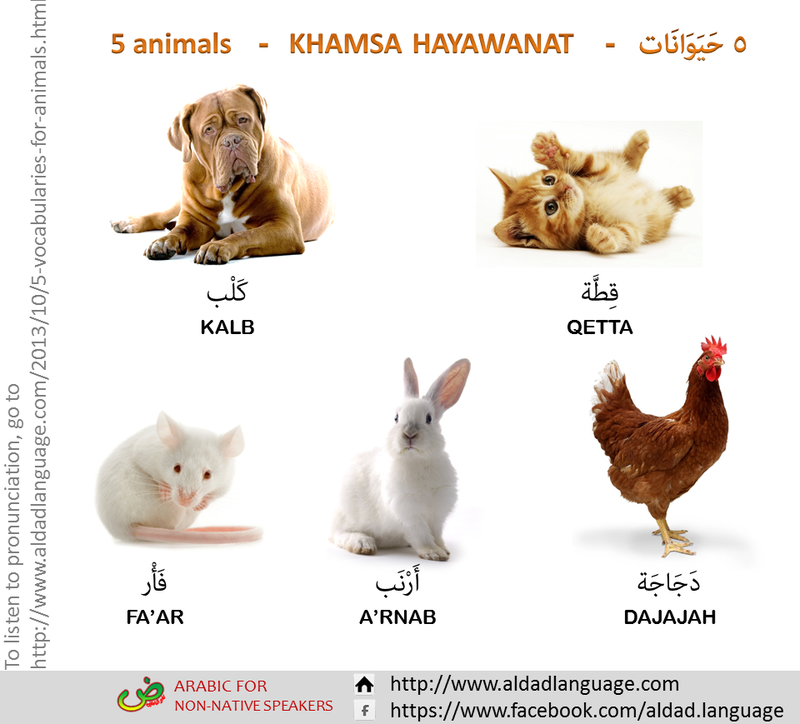 Maybe you don't need to know ALL animals' name in Arabic! But you need to know the most used ones. Lets start with these five. Listen to its pronunciation. Practice with yourself by repeating many times and use it in your everyday language. Inspired by the Pixar movie Up! 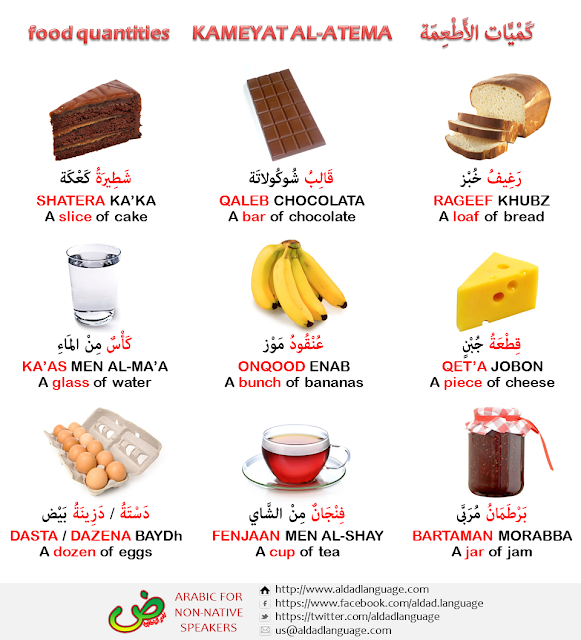 You may be surprised to hear that quite a few English words trace their origins to Arabic. This worksheet shows some familiar English words with Arabic origins. Also, listen to the audio for pronunciation. As you can see from the table, Arabic has had a major influence on the English language. 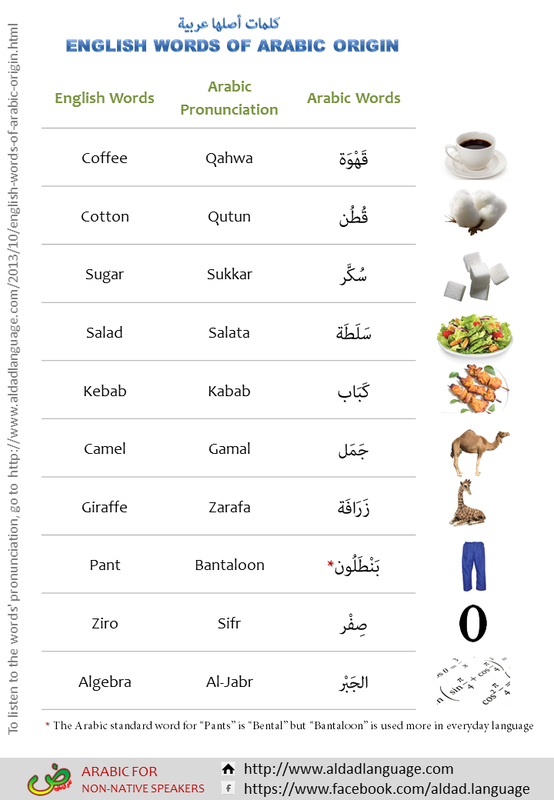 Some English words such as “zero” and "pants" have an indirect Arabic origin, whereas others, such as “coffee” and “cotton,” are exact matches! The influence runs the other way, too, especially when it comes to relatively contemporary terms. For example, the word tilifizyuun (tee-lee-feezee- yoon; television) comes straight from the word “television.” As is often the case with languages, Arabic and English tend to influence each other, and that’s what makes studying them so much fun! Word "salad" comes from the French salade of the same meaning, from the Latin salata (salty), from sal (salt). Word "Pants" is a shortened form of pantaloons. Pantaloons derives from the French pantalon from the name of Pantaleone. The name Pantaleon is Greek. ="Funjan nem al-qahwa, law samaht"
It is gifts season. Lets learn some words in this subject. Use audio for pronunciation also.